Jupiter's ocean-harboring moon may have plate tectonics, a new study suggests. The case for plate tectonics on Jupiter's ocean-harboring moon Europa keeps getting stronger. Scientists had already spotted geological signs that plates within the moon's ice shell may be diving beneath one another toward the moon's buried ocean. Now, a new study suggests that such "subduction" is indeed possible on Europa and shows how the phenomenon might be happening. "If, indeed, there's life in that ocean, subduction offers a way to supply the nutrients it would need," study lead author Brandon Johnson, an assistant professor in the Department of Earth, Environmental and Planetary Sciences at Brown University in Rhode Island, said in a statement. 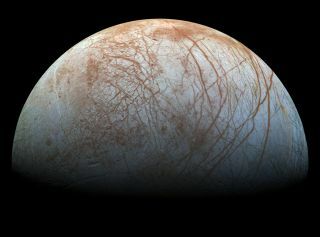 Such nutrients include oxidants, electron-stripping substances that are common on Europa's surface and that could help provide an energy source for life, the researchers said. Here on Earth, subduction is driven primarily by temperature differences between relatively cool (and, therefore, dense) rocky plates and the superhot surrounding mantle. Thermal gradients can't be the prime mover on Europa, however: Ice plates would warm up as they dove, quickly equilibrating to the temperature of the ice below, study team members said. But that doesn't mean subduction can't be happening on the Jovian moon, Johnson and his colleagues found. Their computer models suggest that Europan ice plates can indeed dive — if they're saltier than their surroundings. "Adding salt to an ice slab would be like adding little weights to it, because salt is denser than ice," Johnson said in the same statement. "So, rather than temperature, we show that differences in the salt content of the ice could enable subduction to happen on Europa." Such differences may indeed exist within the moon's ice shell, the researchers said. Upwelling from the underground ocean could deposit salt patchily on the surface, as could eruptions of cryovolcanoes, the scientists said. The presence of plate tectonics on Europa could help us learn more about our own planet as well as the icy moon, Brown said. The new study has been accepted for publication in the Journal of Geophysical Research: Planets.